It was an inglorious ending but not a surprising one. The former Hewlett-Packard Co. logged a 9 percent drop in sales for its last quarter before breaking in two, perhaps a sign that it really is better off in two pieces. The old HP split into two companies on Nov 1, when Hewlett-Packard Enterprise was spun out as a separate business. HPE, as it likes to be called, now sells HP's data center products and services, while HP Inc. sells its printers and PCs. The old HP had been struggling for years as the PC industry withered, the market for high-end servers dried up and customers shifted spending to cloud services, an area where HP barely competes directly. As a result, the former HP reported revenue declines for 16 of its last 17 quarters. For this swan song period ended Oct. 31, revenue fell 9 percent to $25.7 billion, HP announced Tuesday. Like other multinationals, it was hurt partly by the strong dollar; adjusting for currency changes, HP said its revenue would have been down 2 percent. HP's PC and printer businesses had a particularly lousy quarter, which doesn't bode well for the new HP Inc. Sales in each of those businesses were down 14 percent. "In these challenging markets, we are taking decisive actions that will protect our core business which generates the majority of our cash flows," Dion Weisler, president and CEO of the new HP Inc., was quoted as saying in a statement. The enterprise side of the house -- the parts that became Hewlett-Packard Enterprise -- did better. Sales there were up 2 percent, with x86 servers and networking products doing best. 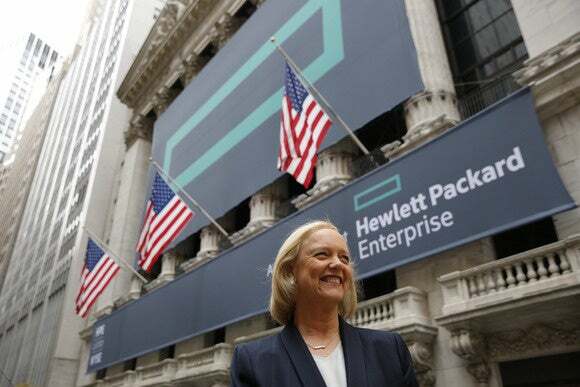 "Hewlett Packard Enterprise is off to a very strong start," said Meg Whitman, HPE's president and CEO, in a separate statement from the new company.